Well, I tried and tried, and did a lot better than could be said of other years, but I still gained about 4lbs over the holidays. I know, it’s just a few pounds. But I felt blahhhh. I didn’t want to! I was wishing that I had thought ahead and got a 3-Day Refresh kit as I loved it the last time, but I couldn’t go back! 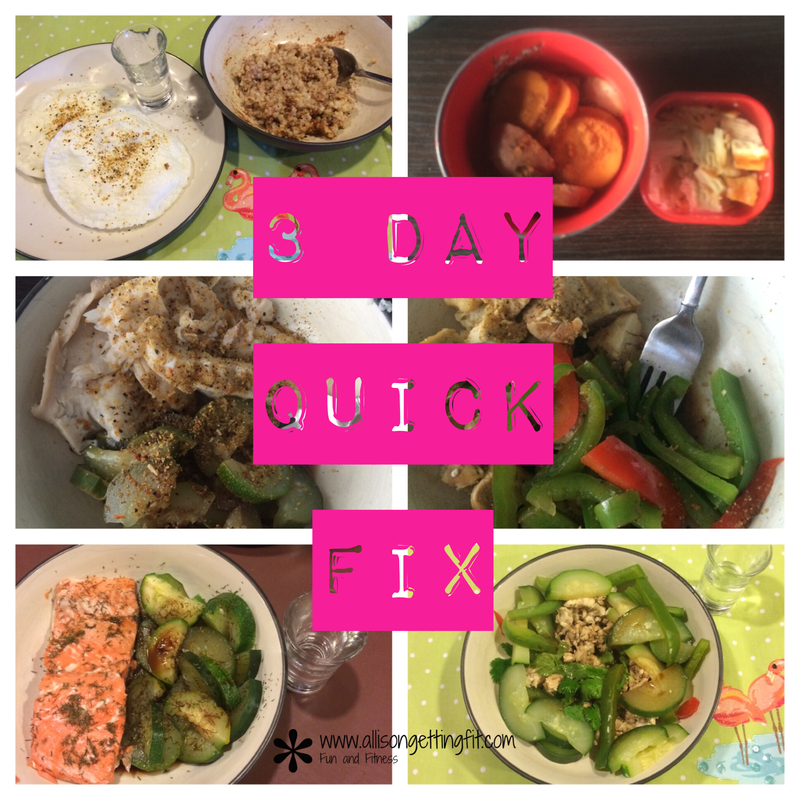 Then I remembered that the 21 Day Fix came with a 3-Day Quick Fix that was for after the 21 days. It had a lot of steamed vegetables on it (four times a day! ), which wasn’t something I was too keen on, but it promised that not only would I drop weight, but I could keep up my usual workouts. Keep up my usual workouts. Said it twice! This isn’t a cleanse. This didn’t leave me hungry, in the bathroom, or like it was time for 3 days of yoga. I don’t exactly feel cleansed either, but I don’t feel that blahhh feeling anymore. So, how did it go? I didn’t take pictures, but I lost 5.2lbs over the 3 days. Yay! Lower than before holidays hit! My stomach looked better than I’ve ever seen it. I was incredibly bored with the steaming though! I almost quit after 2 days just to eat something different. The plan is very rigid. No salt, fruit, dairy, or anything not listed. No cooking in oil (though you do drink coconut oil!) and all the vegetables are steamed. So are the yams. And (gasp!) no Shakeology! Here is one of my days…I left one of the shots of coconut oil out of the pics…sorry! We have egg whites and steel cut oats (plus coconut oil), grilled chicken and steamed yams, steamed fish and vegetables, grilled chicken and steamed vegetables (plus coconut oil), steamed fish and vegetables (plus coconut oil), and ground turkey and steamed vegetables (plus coconut oil). Today, I was ready for my Shakeology ( I had chocolate, first thing I ate today!). I kept up my Insanity Max 30 workouts with no issues and wasn’t hungry ever. Like, I almost skipped the last meal all 3 days not hungry. I would do this again if I needed a quick fix after a rough patch or before a big event. I love that it came as part of a program I love alone…total bonus! How are you getting rid of any holiday gaining? And we’re back…to making lactation cookies! They’re delicious and frankly I can use all the help I can get. They aren’t exactly in the Insanity nutrition plan, but they are in mine. So now I have this tower of cookies. Hopefully they’ll help. Surely they’ll taste delicious! Insanity is going well. It isn’t my favorite workout, but I think that’s because I’m doing it daily. I think it would be something to look forward to if I worked it in 1-2 times a week, but first I want to do the whole program. I went dairy free back in December. There are many things that possibly helped get us from there to here…dairy, probiotics, age…but now Zoe isn’t having the issues she was. Even then, I was told that heated dairy would most likely be fine. So 4 months later, I have now started adding back some heated milk and dairy cooked in foods. So far, so good. It’s only been since last week but there haven’t been any changes. We all feel fine. It’s very likely that the gas issues were just from being a newborn. I am hoping that eventually I will start unheated dairy also. Of course, last weekend when I started with heated dairy, we went to a pizza place with vegan options! I went vegan anyway. It was so good! I had a whole wheat calzone with non-dairy cheese, tomatoes and basil. I would definitely go back and still order off the vegan menu. Our only issue was that there were no blinds. My husband had sun streaming in his face (he did not order from the vegan menu, but we’ll keep him). Even the mushroom “calamari” at the next table looked good and I don’t eat mushrooms. So bring on the hot lattes! Just in time for summer. 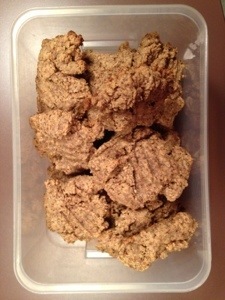 First, lots of people have asked me about the ingredients for the lactation cookies. I got anything difficult to find on Amazon – vat of coconut oil, brewers yeast, ground flaxseed and dairy free chocolate chips. The coconut oil and flaxseed were easy to find, but I wanted large amounts and it was cheaper this way! Yesterday, we went to a Yogibaby class…yoga for mom and baby. Baby was not into it. She cried most of the time so we ended up having “calm the baby at the yoga studio” time. She did laugh at the end so maybe she liked it. We will try again! I didn’t really count it as a workout but I feel some soreness from a few things we did! I’m feeling so close to all better. The only time I’m having sinus pain is when I exercise, and even that is minimal! Three recipe posts in a row! I made Peanut Butter Chocolate Chip Lactation Cookies. Lactation cookies are really nothing more than cookies containing ingredients known to help supply. Anyone can eat them. I wanted to make a dessert for Christmas Eve and Christmas Day and so far the only dairy free recipe I’ve made is for the Peanut Butter Lactation Cookies. 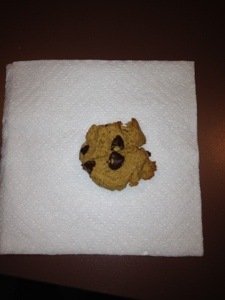 So I adjusted the recipe to a) correct the error I made last time and b) add chocolate chips. Preheat oven to 350°. Mix ingredients together. Place spoonfuls on cookie sheet and use a fork to create the peanut butter cookie lines. Bake for 15 minutes. Makes about 20 cookies. If I had more ground flax seeds, I would have used them in place of some of the oat flour. But I’m running low, so I’d rather have that for my oatmeal. Off to get a few more things done. I’ve got challenge groups to plan and more holiday to dos! Also busy watching the Giants lose 😦 If you want more information about a beginning of year challenge, let me know! I’m excited to join in a challenge with TurboFire! I should be cleared to workout next week. Recipe, Food tip, Picture…what else could you want? Yesterday was a tough day. No need to get into it as infants are unpredictable and some days will be better than others. I got nothing done other than eating, showering and some one handed facebooking. And of course quality time with a little lady! Today was more productive with an extra set of arms. I was able to both shower and get ready to an amount of normalcy I have missed. I wrapped any gifts that are ready to be wrapped. 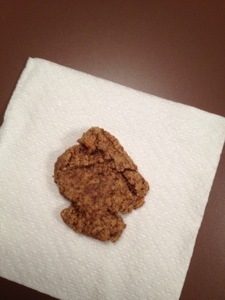 I finished up some laundry and tried a new recipe. I have a bunch left to do before Christmas Eve and Christmas, but I’m doing much better than yesterday! I also changed up the blog…how do you like it? The new recipe was Shakeology based. I wanted to have it for dessert, so I figured I would find something more indulgent than a shake. It was delicious, and perfect for post-wrapping! I halved the recipe because it was just me and I knew I would eat the whole thing if I made two servings. It’s all about portion control and pre-portioning so you know you won’t over indulge! If this was something I could make and eat tomorrow (it would be too frozen then), I would have split it into two dishes to freeze. Putting it in one is just setting up for failure. A tip from me to you. 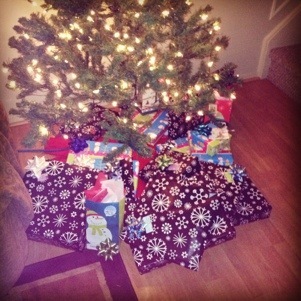 Here are our wrapped gifts beneath the tree. Also, our only holiday decorating this year. Next year, we will rock it. Found my way to the kitchen! It took two rounds of cooking while Zoe slept but I made two recipes today! I was highly motivated to make lactation cookies after I didn’t get as much out of the pump as usual and I figured I may as well put together some Shakeology balls while in there. First, a little about the lactation cookies. Anyone can eat them, even dudes. They just happen to have ingredients that are said to promote milk production. I used the recipe here modified for what I had in the kitchen and for a mistake. Because that’s how I roll in the kitchen. Happy accidents, or at least ones that don’t make the cookie crumble. Preheat oven to 350°. Mix ingredients together. Place spoonfuls on cookie sheet and use a fork to create the peanut butter cookie lines. Bake for 10 minutes. Makes about 20 cookies. This was the easiest recipe I saw and also had the least ingredients…and ones I knew I had or could switch out. The cookies are tasty also! 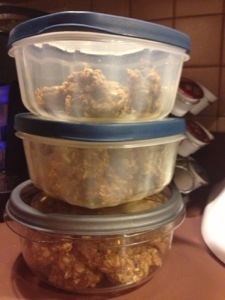 Next time I will lower the oat flour/flaxseed mixture to a total of 1.5 cups. Mix PB2 with water (I usually use the same amount of water as pb2). 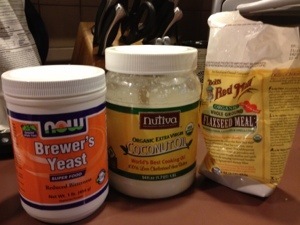 Mix all ingredients (may take some time) adding water or Shakeology if necessary. 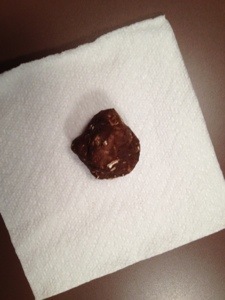 Roll mixture into small individual balls and place on wax paper. Put in freezer until firm. Makes about 12 balls. These both took little time to make and are great to grab quickly, which is what I need right now! Enjoy! How cute is she? We tried to get pictures on Tuesday but she wasn’t having it. Wednesday went better though! I’m getting used to eliminating dairy. It seems that we have a less cranky baby, or at least more predictable in her cries. I hope it’s helping. I really like the dairy free ice cream I’ve tried! I think if I wasn’t constantly carrying this adorable baby at most times and preparing/eating mostly one handed it would be very easy. I know as I get more experienced it will be easier, just like any changes. I have typed this one handed. 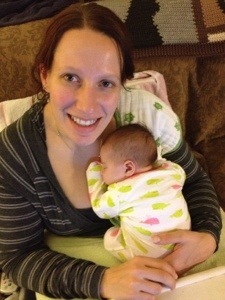 I have a sleeping baby in my arms so it is time for me to catch some zzzzs also. Good naps to all! No cheese in this post! We have a very fussy baby. She is either eating, sleeping (on us) or crying inconsolably. It is so hard to watch as her mother. I just want to fix her. At the doctor today, we talked about this and they recommended an infant probiotic and said if that didn’t work I may want to eliminate dairy from my diet. I’m doing both. If there is anything in my power to make this adorable baby not make that face, I’m doing it. I’ve never gone completely dairy free before and I’m sure I’ll slip up, likely because I’m still getting informed. We did a little shopping today to get some dairy-less snacks as I eat a lot of cheese for a quick nibble. I also bought a few things to try like almond yogurt and some dairy free ice cream. And I switched my Shakeology to the chocolate vegan flavor. So we will see how this goes. Hopefully between the dairy and the probiotic, we can have a happier baby more of the time. Also at the doctor today she weighed in at 6 oz over her birthweight…yay! Breastfeeding is definitely going well so far, though I think it would be easier if I wasn’t the only person who could feed her. I plan to start pumping at the end of this week to build up a stash. Maybe we will start occasional bottles after she is 4 weeks (and maybe I can sleep for more than the occasional 2 hour stretch). Here we are today. Anyone want to guess my favorite top? I only have 5 nursing tops and I don’t like 2 of those. I do a lot of laundry!